Start your day with early morning pickup at your hotel and transfer to Antalya Airport for your 1.25-hour flight to Istanbul. Upon your arrival in Istanbul, your guide meets you at the airport and heads to the old town (Sultanahmet). Begin with a tour of Topkapı Palace, the primary residence of the Ottoman Sultans for 400 years from 1465-1856. View the collection in the Imperial Treasury, which includes sacred Islamic relics from the Prophet Mohammed, traditional clothing, jewelry, and more. Have one hour of free time to purchase lunch at one of Istanbul's many cafes or restaurants, then head to the Hippodrome, aka Sultanahmet Square, which was used for horse and chariot racing, and official ceremonies by the ancient Romans of Constantinople. 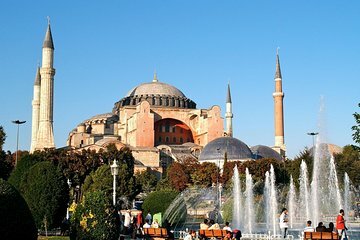 See monuments in the square such as the Serpentine Column, Obelisk of Theodosius, and German Fountain of Wilhelm II, then visit the nearby Blue Mosque in the center of old city, known for its elegant interior decorated with blue tiles. Next, practice your bargaining skills at the Egyptian (Spice) Bazaar where you can shop for jewellery, clothing, textiles, and other souvenirs. Then experience Istanbul from the water during an optional Bosphorus River sightseeing cruise (additional expense). Have dinner at a local restaurant (own expense) then return to the airport around 8pm for your flight back to Antalya where your tour ends with hotel drop-off.